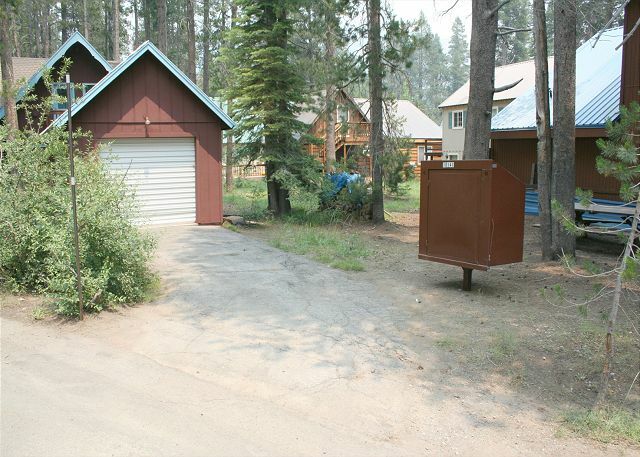 Truckee, CA United States - Hatfield 057 | Donner Lake Realty, Inc. Garbage inclosure is located by the garage. The Hatfield unit is 4 bedroom 2.5 bath cabin, which sleeps up to 10. PET FRIENDLY. 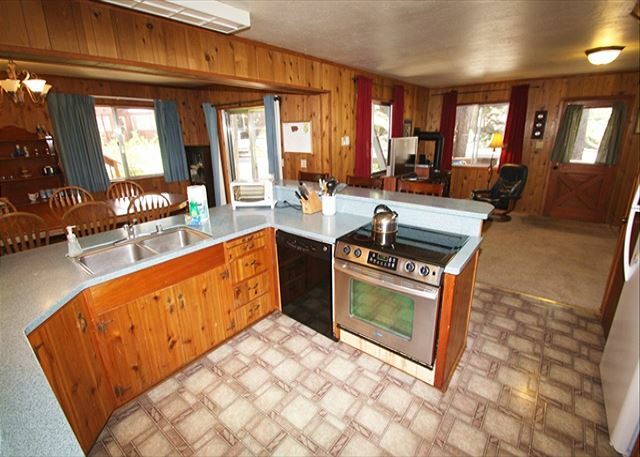 This rustic unit is located at the west end of the lake within 2 blocks of the public beach. The access is level across a good size front deck. 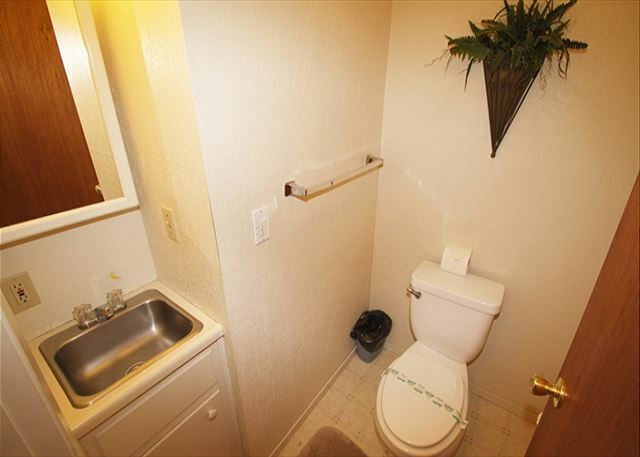 Downstairs is 1 bedroom with a queen size bed, and across the hall is the bath. The living area with new couches, kitchen and good sized dining area make up one big great room. Upstairs are 3 bedrooms, and 1.5 more bathrooms. The kids room has a twin bunk bed and additional extra long twin bed. The spare room has a double size bed and a extra long twin bed, with access to a private deck overlooking the front deck. 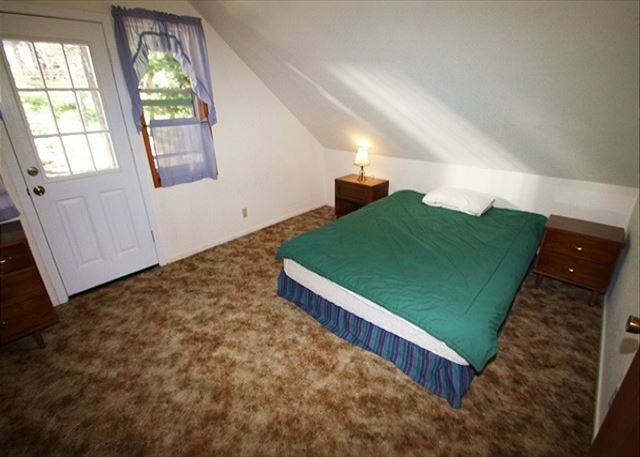 The third room has a queen size bed with private entry from stair leading off the front deck. This cabin is a summer vacation rental and a winter ski lease. The Hatfield unit#057 offers a 10% discount off the rent to active military members. Please call for additional information. Our units do not have sheets, pillow cases, or towels included in the rental, guests are requested to bring their own. However, we do offer linen rental service with 72 hrs notice before arrival: sheets, pillow cases, and towels at a onetime fee of $10 per person. Check in time is 3pm and check out time is 10am. **Nightly Minimum Subject to Change for Holidays** 4 night minimum for Thanksgiving, 7 night minimum for Christmas/New Year's, 3 night minimum for Martin Luther Holiday Weekend, 3 night minimum for Presidents Holiday Weekend, 3 night minimum over the 4th of July, 3 night minimum for Labor Day holiday Weekend. Discounted rate for stay of 7 nights or more!